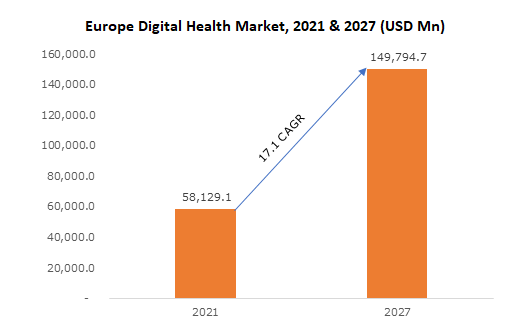 Europe Digital Health Market size was valued at USD 30.0 billion in 2018 and is expected to witness 29.3% CAGR from 2019 to 2025. The Europe digital health market growth can be attributed to increasing use of smartphones, tablets, and other mobile platforms, rapidly improving IT infrastructure, favorable government initiatives, rising demand for remote patient monitoring services, and growing venture capitalist’s investments. However, main challenge that the market is security concerns regarding patient data, and high capital expenditure and maintenance requirement. Moreover, incorporation of IT into healthcare sector is vastly seen and poised to expand in major developed countries around the world. The development of healthcare IT, and government regulations has largely encouraged the adoption of various healthcare IT solutions such as electronic medical records, e-prescribing systems, remote patient monitoring, and wearable medical devices, thus enhancing the growth of digital health market in Europe. Digital health systems segment captured 54.9% market share in 2018. With rising pressure for cost cutting in healthcare industry, the providers are seeking for digital health technologies for monitoring of diseases and save large amount of healthcare costs. Moreover, government-driven initiatives in Europe have gained momentum, resulting into more players in the digital health value chain. mHealth segment is witnessing the most lucrative growth of 38.7% during the forecast period. Increasing focus on personalized care and precision medicine will stimulate Europe mHealth market growth over the forecast period. Growing usage of social media platforms for providing healthcare solutions and rising influence of advanced technologies will boost industry growth in the future. Germany digital health market recorded USD 9.2 billion revenue size in 2018. Factors such as increased adoption of wearables and health apps for monitoring personal health, high disposable income coupled with momentous growth in companies offering technologically advanced healthcare products will foster Germany digital health market in the future. In addition, increasing prevalence of chronic diseases as well as substantial number of elderly people suffering from chronic disease condition will drive the market growth. Some of the major industry players involved in Europe digital health market include McKesson Corporation, LifeWatch AG, Philips Healthcare, Cisco Systems, Cerner Corporation, Allscripts Healthcare and others. The Europe digital health market is highly fragmented with many small and medium players stretched across a number of countries. The major players in the digital health market implemented various strategies in order to stay ahead in the competitive market. Major strategies adopted by the players in the market include new product launch, acquisition strategy, expansion strategy, agreements & collaborations, partnerships & joint ventures, among others. Digital health technology also has potential application in the field of precision medicine. This is an emerging approach for disease treatment and prevention based upon individual’s genetic composition, environment, and lifestyle. Using digital health technology in precision medicine is set to revolutionize the way diseases are treated through a thorough research effort in Europe. Furthermore, an array of medical apps for patients and doctors, along with health improvements are constantly developing in this region. High market penetration of technically advanced digital health devices and the existence of favorable government initiatives is expected to drive digital health market in Europe during the forecast period.